When any passers-by flick through this in a year or two's time, they'll read that the sun was shining in mid-July. No big deal. Except summer hasn't started yet in 2012, apart from those radiant weeks back in March. Today, however, Thursday 12th July, there's a mass of incandescent gas up there and it's warm out. Which is welcome. We whoosh through Wickham Market with a wink at the under construction Co-op and a wave at Cafe 46, then weave out the far side of the triangular square, who knows where. Hopefully Andy, who's driving. Join another road, head off right, and ooh, there's a sign pointing towards a one-track mind, er, road. Like The Skids, we've gone into the valley, for here we are at Valley Farm, home of all things horse-related. 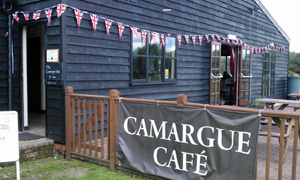 We're less interested in the New Young Pony Club and more concerned with that place over there, the Camargue Cafe. Instantly reminded, visually, of the Riverside at Orford. In we trot -- hey, there's panels showing the indoor riding area -- and a sign on the counter apoligises for today's limited menu 'cos the owners are away. Never mind. No Revett's (the local butcher) meaty goodness for us though there's still soup, sarnies, wraps and paninis. Sandwiches and cans are ordered and it's out onto the decking. Did I mention the sun? Perfectly good BLT with salady bits soon appears, ditto Andy's brie & bacon. All rather fine to be nibbling away while wondering about the workings of "horseball" as a sport. Briefly back inside to run a critical eye over the wall's watercolours and equine snaps, then to seek sweetness in the guise of two slices of chocolate and cola cake (and a coffee). They didn't last long. Memo to us: come back another day to sample the full menu. In the meantime, clear round with no faults. If it was a car -- Rolls-Royce Camargue. If they were passing by -- Cornelius Lysaght.